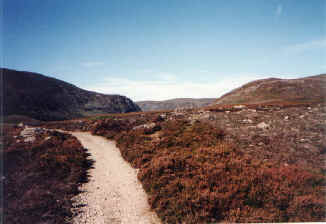 Mount Keen, the most easterly of Scotland's Munros, cannot be readily linked to a round of mountains because of its relative isolation and, as such, is normally conquered by a direct route either from Glen Esk, in the south, or Glen Tanar, in the north, by those content to simply add it to their list of 3000ft plus peaks. However, this particular hill can provide a challenging day out for those who are happy enough to wander off the beaten track and explore some the neighbouring countryside. Those who do will find an area richly steeped in local folklore, the knowledge of which can only add to the thrill of being in the great outdoors. The start of this particular adventure, like so many in this area, is at the car park at the end of the Glen Esk road. Carry on up the road a short way and a signpost points the way to Queen's Well. The track enters a wooded glade and runs past the substantial house at Auchronie before the conifers peter out and a large metal gate signals entry to the Glen Mark estate. The route here is easily followed as the track acts as a driveway of sorts for the cottage at Glenmark which will be reached in less than an hour at an easy stroll. To your left is the Water of Mark, protected from the over inquisitive by an electric fence which is part of a scheme to increase salmon numbers, and the skyline over your right shoulder is dominated by the rolling slopes of Greenbush. The altogether more rocky faces of the aptly-named Hard Hill are visible to the east. To drink from the well now would be sheer folly as the water has been contaminated somewhat by the copper coins thrown into it by wish-makers and there is also the likelihood that some of the local sheep population have made deposits of their own! The track branches here and, while it is tempting to bear right and follow the direct ascent up Mount Keen, those with a sense of adventure will continue left and follow the Water of Mark where another thirty minutes hiking brings a cascading waterfall into view. These falls are created when the waters of the Burn of Doune topple down a steep rocky gorge to join the Mark and this spot makes a perfect site to stop and have a bite to eat. The waterfall itself can be explored by those who are confident at scrambling and, in the height of summer, the pool at the foot of the torrent can be used by the masochistic as a natural jacuzzi! Leaving the waterfall and continuing along the track in a south westerly direction brings you into an area famed for a romantic Jacobite tale. Over a hundred years before Queen Victoria was quenching her thirst in the glen, one of the leading Jacobites, the Laird of Balnamoon, concealed himself in a cave here for months after the Battle of Culloden. Still known as Balnamoon's Cave, this intriguing hidey-hole is just as difficult to spot today as it was for the soldiers and troopers back then. The cave is marked on the OS map and lies in a spot about 75 feet above the river bank. The ground around and above is very rocky but the cave itself has a grassy top with a narrow vertical slit for an entrance. Luckily for Balnamoon, who had a high price on his head, the cave opens out to reveal a cavernous interior. Leaving the cave, continue along the southern bank of the Water of Mark past another smaller waterfall and keep going until you are clear of the steep and rocky slopes of the Craig of Doune on your right. At this point we leave the security of the path and begin crossing open ground, so it is a good time to check your map. We want to be heading for the 740 metre high Hill of Doune and must find a suitable spot to cross the river before climbing its grassy slopes. This doesn't present much of a problem in summer but after periods of heavy rain the burn will be fairly fast moving so take care. Once safely across, make for the summit of the Hill of Doune, keeping the Burn of Doune to your right. This is a fairly unrelenting climb but the view from the top makes it worthwhile. From here you can pause to look down the entire length of Glen Mark before turning your attention to Mount Keen which dominates the view to the north east. The flat plateau of Doune is criss-crossed by stalkers' paths but the Munro never leaves your view and you can pretty well choose your own route towards it, bearing in mind that you will have to cross the infant Burn of Doune at some point. As you approach the mountain you can content yourself with the fact that you have already gained a fair bit of height and have been spared the rather less exhilarating trudge up the honeypot route from Glenmark. To make the 939 metre summit you have to cross the Mounth Road, which cuts into Mount Keen's western shoulder, and this old thoroughfare looks like a motorway compared to the narrow paths you have been used to for the last few hours. You should have no problem finding the ever-widening track to the top and Mount Keen is one of those hills with those delightful false summits - just when you think you are are there it starts climbing again! Persevere and the triangulation pillar will soon appear, and along with it a superb panoramic view which, on a clear day, includes Lochnagar, another mountain with Royal connections. The route back to the car is straightforward - just follow the main path from the summit and don't worry, it takes less time than you think! Map OS Landranger sheet 44. Start/parking Car Park in Glen Esk. GR: 448805. Grading An easy walk as far as Balnamoon's Cave on a distinct track but the ascent of the Hill of Doune should be made using a map and compass, especially in poor visibility. Suitable for fit and competent walkers only. An alternative route for children and those less confident about their ability is to follow the main ascent from the Cottage of Glenmark.